We’ve held off for quite a while, but it’s time. We’ve played Tetris often enough that we should be familiar enough to write this. Tetris is the single best-selling game in the world, with 143 million games sold at the time of writing. It’s one of the most iconic and well-known games, together with games like Pac-Man, Space Invaders and Pong. It is a classic, and it’s a game we’ve been looking forward to. I was just talking to Peter, asking him what we could say about Tetris. Just about everything that can be said about it has been said at this time. Tetris is an incredibly addictive puzzle game. Its simplicity makes it easy to pick up, with no real control problems, and the difficulty ramps up gradually enough that you don’t tend to notice it until it’s too late. And only an actual game over is enough to end it – why stop when you’re nearly there? From a game design perspective, there’s one thing that stands out to me – the decision to go for tetronimos, four blocks, works out well. I’ve played knock off games that allow other sizes. Three only allows for two blocks (using the current setup) and little challenge, five and higher increase the number of blocks, making it infeasible to plan ahead. It’s difficult enough in conventional Tetris when you have a bit of bad luck and get the wrong pieces, with different sizes it becomes unbearable. It all feels perfectly balanced, pretty fine, and the reason it’s even now being sold consistently with no real changes made to the gameplay. Its thirty years of popularity are as telling as anything else. 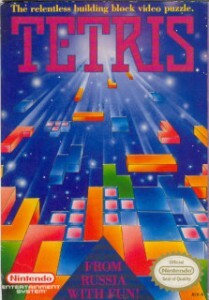 As Jeroen said that I said; everything that can be said about Tetris has been said already. So, because this is such a pick up and play game just head over to this link here and play some rounds.